Do you have an Equipment Failure? No Problem! Ship your machine in need of repair to any of our Regional Depot Repair Facilities and the Case Financial support team will quickly diagnose, repair and return it to you in as little as 1 day! Our Depot Maintenance Service features a support staff of in-house service specialists who will quickly diagnose and repair most major brands of Check Scanners, POS Printers, MICR Encoders & Currency Handling Equipment. Time and Materials Repair – Depot time and materials repair offers a convenient, pay-as-you-go way to obtain repairs on your financial equipment when it breaks down, becomes damaged or simply is not working properly. Equipment is sent directly to our depot facility and is promptly diagnosed by our highly trained staff. An estimate for the printers repair is provided, and upon approval of the estimate, Case Financial will promptly make the repair, and ship back your equipment — in as little as 24-hours. Annual Service Contracts – Depot service contracts are a cost efficient way to keep your financial Equipment up and running. Depot service contracts include unlimited repairs, all non-consumable parts, and labor to keep your equipment running top notch. The Goal: Extremely Cost Effective Equipment Servicing. 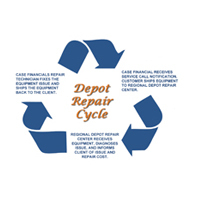 The Solution: Case Financial Depot Repair Maintenance Service. The most cost effective maintenance service available. Advanced Exchange Units available for an additional fee. Annual Service Agreements or T&M Options available. All Major OEMs are serviced. Check Scanners, POS Printers, MICR Encoders, and Currency Handling Equipment. Case Financial is not responsible for damage done to equipment during shipping. Please visit our Contact page to request more information about Depot Repair.